Are you thinking about taking your dog on your bike rides? Plenty of dogs enjoy biking! There are right ways and not so good ways to go about it though – safety first. Once you’ve found a safe, comfortable and of course FUN method that works for both you and your dog, you’re set for plenty of awesome biking trips together. Whether it’s a quick ride down to the local store, or a longer adventure – there are a number of ways to get your dog on the bike with you and share the experience together! Baskets are generally the easiest and most common way you’ll see a dog cruising along on a bike. With that aside, for anyone with a small dog a basket can be an awesome choice to get your dog out on the bicycle with you. While the traditional wicker or cane basket is what immediately comes to mind (and are still a great option if you love that old style look), we now also have significantly more choices at our disposal – many not looking like baskets at all but still functioning in the same way. There are some truly luxury dog bike baskets which are more like portable doggy beds, or you can just stick to the very basics. 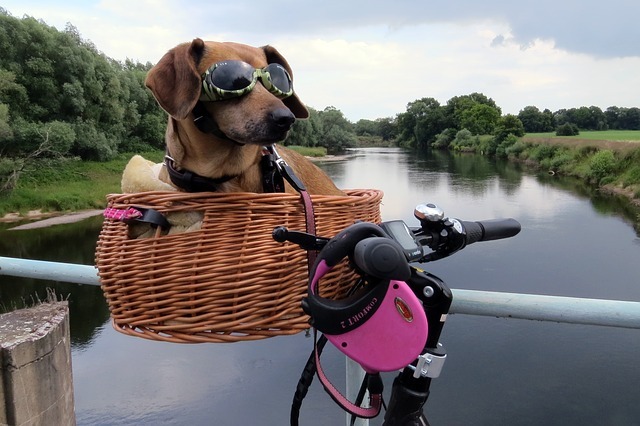 A dog bike basket can be put on either the front or rear of your bike – of course, you need to choose one that’s made to be put where you want it to go. Additionally, rear baskets are only suitable for some styles of bicycles that have the appropriate setup to support it securely. A lot of the best bike dog baskets double up as a carrier. This makes it really simple to attach to your bike for the ride, then simply remove it (with dog in place) and use it as a comfortable carrier – many come with shoulder straps that are padded. Dog trailers will extend the length of your ride by allowing you to tow your dog behind your bicycle in a secure carrier. Unlike baskets, a trailer or cart can usually safely accommodate a larger sized/weight dog – so if you have a bigger dog this is one of your only options. However: remember you’ll need to use your pulling power to cart your dog along behind you. Easy bike rides on smooth, relatively flat inclines don’t present a problem for most people wanting to use one of these trailers. Fitter, more experienced cyclists can obviously cope with more challenging terrain – you’ll soon get a grip on your limitations (and they will improve over time), the first time you take your dog out in his new bike trailer. Out of all the choices available to us for biking with our dogs, using a leash or similar type of attachment that allows your dog to run alongside the bike is certainly one that has a lot of potential risks associated with it. Some people understandably just aren’t comfortable with this sort of setup. Using a normal everyday leash that’s just attached to your bike is not how to go about it. Special leashes have been designed specifically for use as a bike attachment – and these are the only ones we should consider using for such purposes. In short? Never use a regular leash to walk your dog attached to a bicycle.